An appropriate set of Change Parts, determined by the can type and size being tested, are installed on the unit. A can is clamped in place; for can growth, the measurement fixture is placed over the can and the sample is pressurized to customer specified pressures and growth is automatically measured at these points; for buckling, the fixture is removed and the can is pressurized at a specified rate until the bottom dome fails. 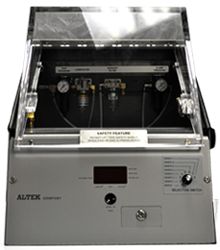 At all times the pressure in the can is indicated on the front panel digital display and growth measurements are indicated on the gauge of the measurement fixture. This unit requires the use of Change Part 9845. Click Change Part number for further information.